The Antigua is a million dollar designed home at a very affordable price. We took features and details common in much more expensive homes and made them standard in the Antigua. All Avalon models can also be built with a side load 3 car garage with a storage / workshop room. Lots generally must be at least 95 – 100 FT wide for this feature. 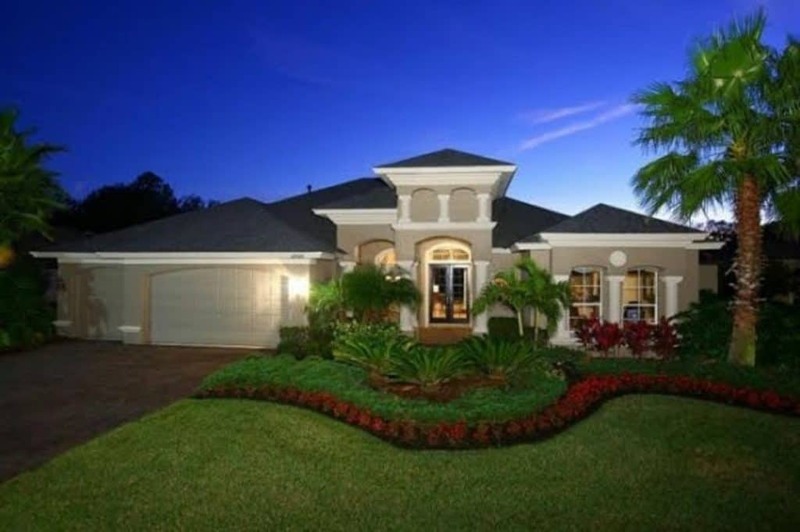 The Antigua w/Bonus-Up at 3654 SF is the model shown in the photo gallery. 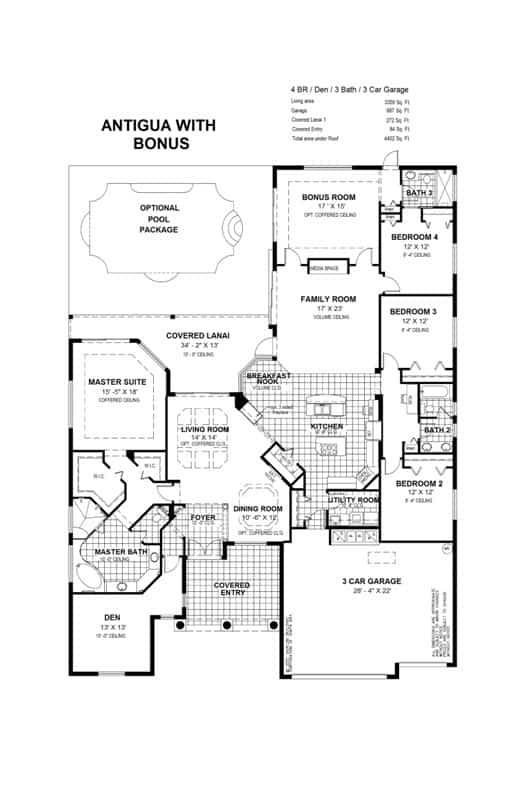 It is a 4 BR/3 BA/Den/Bonus Room/3 Car garage home. The family room and kitchen, again as key living areas, are oversized. The Family Room is 17 FT wide with a 12 FT triple slider at the side and a 5 FT double slider in the rear for great outdoor and pool views. The Family Room is vaulted at approximately 14 FT high with a full length potshelf and built-in media center for warmth and enjoyment. It also has an 8 FT French Door leading out to the Lanai. The breakfast nook comes standard with triple mitered glass to enhance the views. The Kitchen is truly gourmet with two big Islands and beautiful staggered cabinetry. A separate cooktop and built-in oven/microwave are standard. It’s great for family life and entertaining friends. The Kitchen ceiling is flat at 10′ 8″ for spaciousness and visual separation from the family room. The walk-in pantry is huge and can also be easily converted to a double sided butler pantry. The Master Suite is extremely unique and elegant. The entry is “”U” shaped for a greater feeling of separation and privacy. The Master Bath is totally free form with the tub deck in the shape of a whale and the tail becoming the shower seat in an over-sized double headed shower. A free-form coffer ceiling matches the tub and shower below. The bath is also designed for the option of looking out from the whole bathroom, the tub, and the shower, into a private garden solarium. It is totally unique, rich, and luxurious. The Den is big at 13 x 13 and has its own private, secluded entry. There are two separate and distinct lanais adding to the big feel of the home and great outdoor living. The kids bath has separate vanity and bathing areas. The upstairs bonus room was purposely designed to sit over the rear of the home for privacy and even more great outdoor views. It is large at 15 x 30 and filled with three large picture windows. The other Antigua Models in the series have a similar layout but one has the Bonus Room downstairs like the Avalon IV, and one comes without a Bonus Room in case it is not needed.